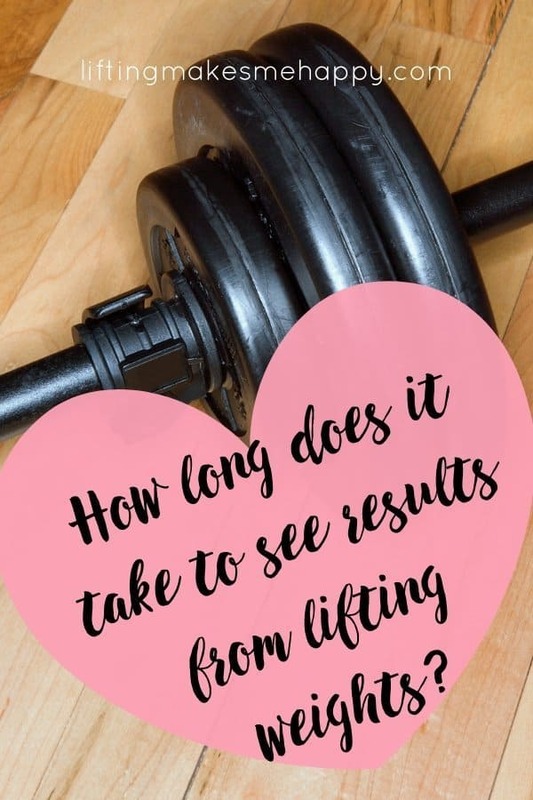 How Long Does it Take to See Results from Lifting Weights? One of the first questions I had about working out was, “How long does it take to see results from lifting weights?” This was aside from the questions I had like, “How on earth do I lift weights?” or “Am I going to get bulky?” Hear me out, please! 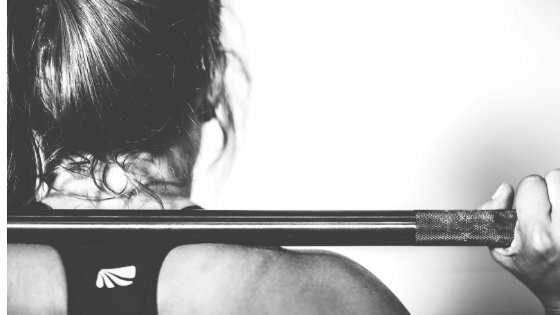 First of all, I know that lifting weights can feel intimidating if you’ve never done it before — especially if you’re trying to start in a public gym. 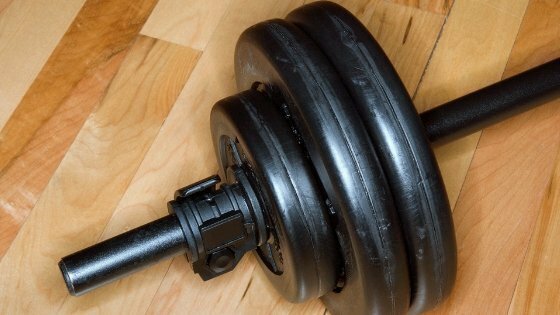 Second, lifting weights in itself will not make you bulky. Please know this! When I first started, I thought I’d end up looking like Arnold in no time but that’s just not how it works. Lifting weights is one of the best things I’ve ever done for myself and I like to shout it from the rooftops whenever possible because I want others to experience the awesomeness and the power and the strength and the confidence that it brings. Now that we got that outta the way! Your current body shape and body fat percentage. How often you’re lifting weights. Let’s start with caloric intake. If you are currently trying to lose weight and you have a high percentage of body fat, it’s probably going to take you longer to visually see the results you’re after. However, just because you can’t see results, doesn’t mean they aren’t there! I’ve read a lot of magazine articles and books on lifting weights since 2008 and the one overall consensus I’ve seen is to lift weights at least 3 times per week to see results. You definitely don’t have to lift every day to see and get the results you want, it just needs to be consistent. And lifting weights at least 3 times per week is consistent enough to see results. The more times you workout each week, the faster you’ll likely see results. This doesn’t mean you have to workout every day! Like I’ve mentioned here before several times, my sweet spot tends to be 4 days per week for lifting. I like the every other day schedule because then I know I always have an off day after a workout day. I would suggest finding your own “sweet spot”. Create shape – building your muscles does this! Also known as “toning”. Gaining strength – having a goal to do a pull-up on your own or squatting 100 pounds. Losing weight – building your muscles helps you burn more calories at rest. Seeing the change in your body shape. When you actually see change in your body will depend on all of the factors I talked about above. However, if you’re working out consistently and keeping your fuel (food) in check, I don’t think it’s out of the question to see results in as little as 1 to 2 weeks. I’m pretty sure the changes I began to see right away is what kept me motivated to lift! Changes can happen quickly if you’re working hard, challenging yourself and fueling your body right. Just limiting sugar and cutting out some carbs can create change pretty fast in my body. And I love bread so that’s hard sometimes! But change can happen very quickly for me if I lower my carb intake. And this doesn’t mean I need to go super low carb, I just need to consume fewer carbs and choose healthier types of carbs. Again, I love bread. And pasta. So this is one of my biggest challenges. Seeing changes in your strength. In order to gain strength, you have to keep challenging your muscles. Let’s say you start out with doing lunges with a pair of 5# dumbbells. It does take time to build strength but once you notice it’s becoming easier to do 3 sets of 12 lunges with 5#, you could try upping the weight to 10# dumbbells and doing fewer reps — maybe 3 sets of 8. And if you’re wanting to shape your booty, definitely do lunges. I personally hate them because they’re hard, but they’re worth it! Seeing changes on the scale or a loss in inches. When you start lifting, please don’t obsess over the scale. Over time I’ve decided not to even use a scale to measure my progress. In fact, I threw mine in the garbage because it just made me upset. It’s very likely you’ll actually gain weight when you start lifting weights and that’s because you’re building muscle. A pound of muscle takes up a lot less space than a pound of fat. So even though your weight may be increasing, your body could actually be shrinking. I’d rather focus on what I see in the mirror and how my clothes fit rather than worry about the number on the scale. My husband ended up buying another scale to track his growth but I’ve learned to just stay off of it because it just pisses me off! Haha. There are much better ways to measure progress than a number on the scale. This will be different for everybody depending on your efforts and your current body shape and fitness levels. Every time I start a new program or workout consistently (at least 3-4 days per week), I’ve always started to notice results by the end of week 1 or 2. I’ve always seen results a little faster if I incorporate at least 10-15 minutes of HIIT 1-2 times per week. Again, this will vary for everyone but if you’re putting in the work you will see results from lifting weights. I think lifting weights is one of the best things you can do for your body. It makes you stronger and that is always something to feel good about! Eating and Lifting Update… and Happy June!